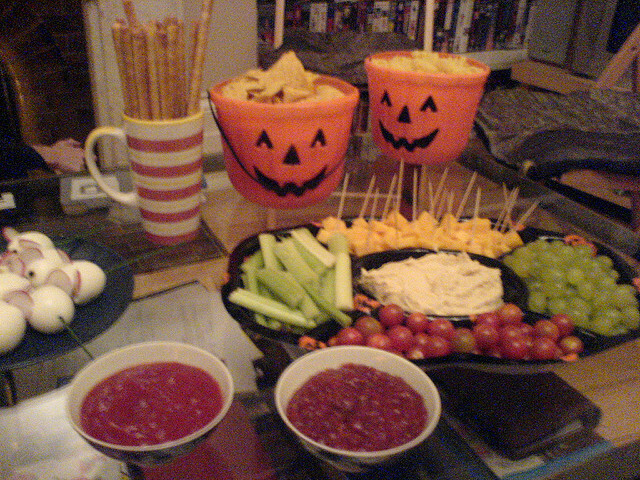 Incorporating fruits into a Halloween snack will be no problem if you make them resemble cute little monsters. Slice bananas in half and add chocolate chips for a sweet little ghost. Use two slices of apples to make vampire teeth, and attach marshmallows with peanut butter to the apple slices to make teeth and fangs. Peel clementines and attach a small pretzel rod on top to make a spooky little Jack-O-Lantern. For snack time, create healthier versions of their favorite snacks and desserts. Make rice crispy bars in the shape of pumpkins and ghosts instead of serving an indulgent cake. Make caramel apples dipped in healthy toppings like nuts, coconut flakes, or Goji berries. Create broomsticks by attaching pretzels rods to string cheese with a chive. Make a twisted stuffed bell pepper with oozing brains by cutting off the top, carving a small pumpkin face, and filling the pepper with the pasta of your choice. Downsize the Trick-or-Treat candy haul. Set a rule that your kids can only keep their favorite ten pieces or can have only one piece of candy every other day. Setting up a rule can help them think consciously of what they are eating and will limit their sweet intake sharply. After sugary treats, remind your kids to drink plenty of water to wash away any sugar, sticky substances, and acidity left behind from candy. The holidays are festive and fun, but don’t let them forget their healthy oral hygiene habits! Remind them to brush carefully and regularly. Remind your kids that Halloween treats are just that—treats! 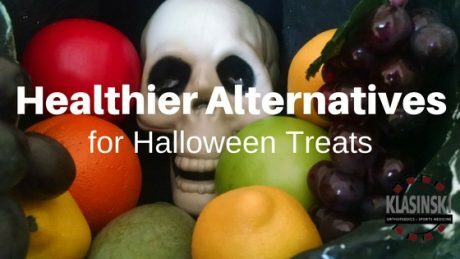 Help them have a healthier Halloween by reminding them of habits that will keep them healthy, energized, and happy for life. For more ideas on sustaining your happy and healthy family, visit Klasinski Clinic today! Secure, 24 hour access to our clinic online.